This bee and honey jar, with pretty blue cornflower, needlepoint design is hand-painted onto 18 mesh mono Zweigart needlepoint canvas. This water-color inspired needlepoint design has enough detail in it that it looks lovely stitched in a tent stitch, perhaps with a contrasting stitch for the background. Sold canvas-only or with fibers. If you select cotton fibers we will send you DMC cotton floss; if you select wool we will send Bella Lusso boutique wool and for silk fibers we will send you Planet Earth Pepperpot fibers. If you require stretcher bars we recommend two sets of 12". 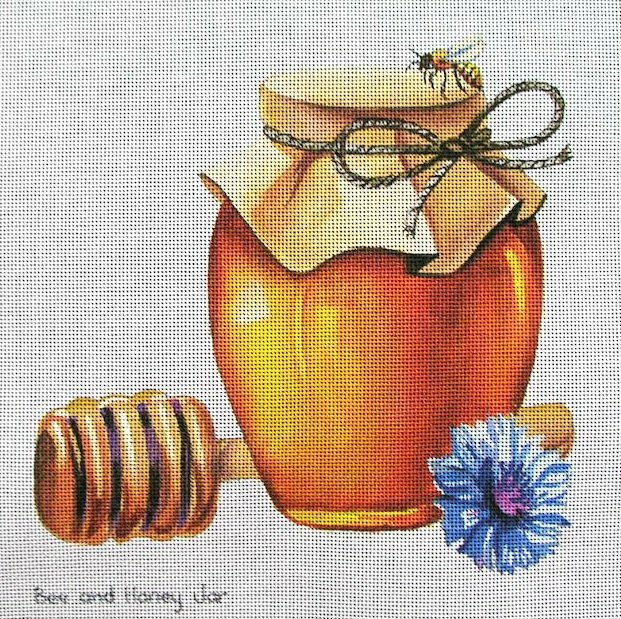 This Bee and Honey Jar canvas is usually in stock and ships within a few days. Click here for shipping costs and information. Contact us with questions about this needlepoint design. We are always happy to help.